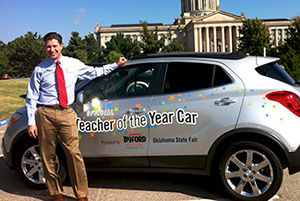 I am excited to begin the 2014 OKTOY Blog, and I agree with many friends that this is long overdue! 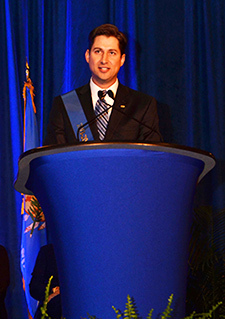 First, I should recap what I’ve been doing since Sept. 17, when I became Oklahoma’s Teacher of the Year. Immediately, the outpouring of support and congratulations was truly humbling. I became reacquainted with many friends and teachers from years ago, and the flood of memories brought into poignant focus my journey to this point. Since then, I have fulfilled numerous invitations to meet with our Teacher Preparation Programs throughout the state. I’ve presented the idea of “Teacher as Leader” to my alma mater, Oklahoma City University, as well as to the University of Central Oklahoma in Edmond, East Central University in Ada, Southwestern Oklahoma State University in Weatherford, Northeastern State University in Broken Arrow, Northwestern Oklahoma State University in Alva, and the University of Oklahoma. At one point, I called my wife to tell her I have to stop meeting so many interesting people in such quick bursts: My brain needs time to catch up! I also began my goal of visiting all of the high school orchestra programs in the state. Norman North, Tulsa Edison, Stillwater, Edmond Memorial and Santa Fe, Midwest City, and Northwest Classen High School in Oklahoma City, as well as two middle schools – Belle Isle Enterprise in Oklahoma City and Edmond Cheyenne – all spent a little time under my baton. My goal is not simply to visit, but rather to assimilate the many great ways of teaching my primary subject, string orchestra, into a cohesive “best practices” outline for all of our benefit. We often end up so busy that we become isolated, working twice as hard as necessary instead of tapping each other as resources. I still spend one to two hours daily administrating my own Edmond North orchestra program, and I envisioned the Teacher of the Year schedule to be much, much busier. 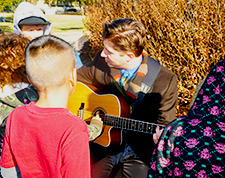 I am hopeful that the spring semester will see a renaissance of the OKTOY program, now restored to full funding. If you see a need, a place in your community that could benefit from a message by the Oklahoma Teacher of the Year, please don’t hesitate to call on me at teacheroftheyear@sde.ok.gov. Thanks for your support!